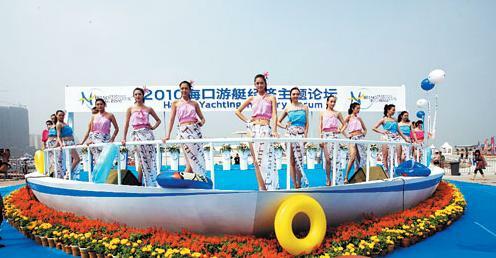 Around 400 delegates attended the 2011 China (Haikou) Yacht Forum held in Haikou on the Island of Hainan. The forum was opened by Zheng Wei Hang of the China Cruise and Yacht Industry Association (CCYIA). On day 1 of the forum delegates who came from all aspects of the marine industry in China heard from speakers from industry and government regarding current progress and future plans for development followed by a Q & A session with the panel being comprised of leaders from international marine organizations ranging from Australia to America. Topics discussed or presented ranged from government policy on the registration and pleasure craft to the importance of the industry to the Chinese economy seen by both national government and industry leaders. Generally the Forum had an upbeat positive atmosphere on day one where, although challenges were admitted, opportunities could be seen. The day concluded with a gala dinner giving people the opportunity to network and discuss what they had heard during the day. Overall the messages heard by delegates were positive and clearly demonstrated that the understanding of the market potential and what was required was understood by government organs and industry bodies alike. Day two of the China (Haikou) Yachting Industry Forum started with a panel representing the city mayors of some of China’s coastal cities sharing their visions of where yachting development in their cities would go in the future. There was a surprising lack of consensus with one mayor still firmly believing the future would follow history with increasing numbers of large yachts being attracted to his city. The other mayors had quite different ideas with the representative from Zhoushan going as far as promoting public marinas to further encourage the middle class into boating by making marinas more affordable. Interestingly throughout the day the term boating industry in place of yachting industry crept into the vocabulary, a small but important step to the understanding that to expand the user base in Chinese boating requires a widening of the market place rather than increasingly targeting just the very rich. The morning session was conclude with a forum of lady entrepreneurs in the marine world in China hosted by Ms Zhou Jian, herself General Manager of Double Happiness Yachts in Shanghai. While most of the speakers were career managers within the industry of particular interest was the only end user to speak at the entire forum. Hong Kong based architect and interior designer Inge Strompf-Jensen freely admits she started her boating life as ‘decoration’ but learned to sail, bought her own boat, often sails with a ladies crew, bought her own boat and rose to become the first Lady Commodore of the Royal Hong Kong Yacht club, undoubtedly the premier member’s run yacht club in Asia. Lately work and passion has combined with Inge producing the interior design work for a radical wave piercing trimaran currently being built in China. The afternoon was an incredible 14 speakers starting Julian Goldie of the Yacht Harbour Association from the UK who explained their Golden Anchor Scheme through to industry veteran (Jimmy) Ma Jing Ming of Marine Depot whose more than 35 years experience, in the marine hardware OEM and aftermarket business, producing in China and supplying chandlers and to top western builders across all that time as well as building boats in China, gives him a unique perspective of the yacht and boat industry in China. The formal part of the proceedings was concluded with the introduction of a report on the industry in China compiled over the preceding months by an independent editor.